Cure one today, a world without leprosy tomorrow. If you cannot commit to Cure One, but would like to make an urgent one off gift, please click here. For New Zealand citizens, all gifts $5 or more are tax deductible. Click here for more information. Completely cure, care for and restore one person affected by leprosy, like Niran. Like Niran, a little boy in India. Niran’s mother passed away when he was 9 years old leaving his leprosy-affected father unable to care for him and his brothers and sister. To make things worse, after moving to live with his older brother, Niran discovered that the patches on his skin were not simply a skin condition, but were in fact leprosy. 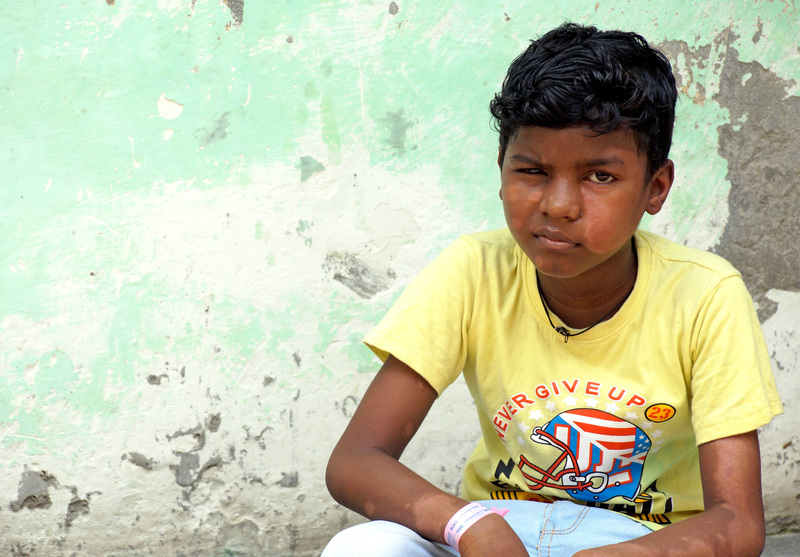 Terrified, little Niran was put on a 12-month course of medication to cure him of leprosy. Unfortunately the treatment came too late to prevent the telltale signs of leprosy taking hold. It is very sad to see someone so young already having suffered so much. Niran’s hands have come clawed, making it difficult for him to perform even simple everyday tasks like eating, or holding a pencil. The patches on his skin have spread, and nerve damage also means he cannot fully close his left eye, leaving it vulnerable to infection. "I stopped going out to play with my friends. I'm so scared they will find out I have leprosy." Says Niran in despair. Through your kind support and God’s love, leprosy-affected children like Niran can become miracles in themselves, as we cure, care for and restore one person at a time. Together, we can give Niran's story a much happier ending. When you become a Cure One supporter, you will have the incredible experience setting someone like Niran completely free from leprosy. The process involves medicine; desperately needed hospital care; and assistance to restore the person back to their community, through education and/or training for a livelihood. If you require any assistance you can call Kiri within business hours on 0800 862 873. She will be more than happy to organise your payments over the phone, or send you out the appropriate forms. As a Cure One supporter, we will keep you closely connected to Niran's progress, as an example how your gifts are setting someone free to rebuild their life after leprosy. Cure One like Niran today! Just $20 a month will Cure Niran - you will help ensure leprosy is detected early and provide the course of medicine that eradicates leprosy. For $29 a month you can help Cure and Care for Niran, which means your gifts can go towards providing ongoing professional care, and help to educate deprived communities that leprosy is a preventable disease, not a spiritual curse. Or for $36 a month you will Cure, Care for and Restore – enable Niran to complete his schooling, learn a trade, and potentially become an engineer like he so desperately wants. Your support also enables Niran’s family to join a local self-help group, learn a trade or set up a small family business to earn money, and lift themselves out of poverty. Your help is absolutely vital to someone like Niran, because there is no way they can afford the care they need to overcome leprosy in their life. Leprosy is curable. Curing leprosy simply involves a course of medicine taken over a few months. We are the first generation to have a cure. We are now within sight of a world without leprosy. In the last 30 years, 15 million people have been cured of leprosy. But there are still 5 million people living with this dreadful disease. You can help free the world of leprosy forever, by signing up to Cure One today. What a wonderful way to achieve a world without leprosy. One person at a time. Please fill out the form on this page now and become a Cure One supporter.